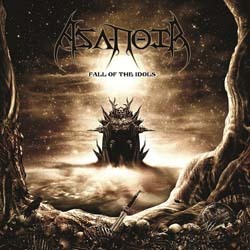 Finnish symphonic epic dark metallers Asa-Noir from the town of Hämeenlinna have recently released their debut album “Fall of the Idols“. The band was originally formed 10 years ago, in 2004, inspired by Norwegian black metal. As more members joined them, new musical influences were added and slowly Asa-Noir’s sound changed, evolving into something more personal. The band self-released its first work, the 5-track EP “Reforming Heathen Origins” in 2011, and in the end of 2013 they signed a deal with Aural Music’s sub-label WormHoleDeath in order to release their debut full-length on June 23, 2014. Their music isn’t easy to categorize in a specific genre, since they mix various elements in their sound. What is certain though, is that the band has made an impressive effort in terms of production and sound quality. Both guitars and keyboards are very dominant in the mix, either taking alternately the leading role in the orchestrations, or cooperating harmonically. The black metal elements are totally gone and their guitars have a sound approach closer to melodic technical death and classic heavy metal, with amazing epic leads and catchy rhythmical riffs. Their keyboards are of a very symphonic nature, creating a really impressive epic, dark and majestic atmosphere! There are parts where synths give an almost soundtrack feeling to the music, other parts where they turn to melodic piano passages or simply add a folk touch in the music. Henri’s vocals are perfect for the band’s music: a great combination between screaming and epic clean vocals, changing in “brutality” depending on the song’s atmosphere. I’d say that vocals is the only ingredient of their music that still has some black metal remnants. “Fall of the Idols” includes totally 10 tracks and its total duration is a little over 43 minutes. Apart form the wonderful and impressive sound, Asa-Noir have also very interesting and quite diverse compositions. I admit though that while I liked some songs very much, like “Solitude in Silence” and “Hawthorns for the Jotunn’s Harlot“, some others left me indifferent, but that’s only a matter of personal taste; either way the overall quality of the album is very good. Their lyrics are in English, dealing with the dark side of human nature combined with themes from Norse mythology. “Fall of the Idols” is a very solid work, with great sound quality, a really promising debut album. If you are into symphonic metal, with a heavy epic dark atmosphere and some extreme metal elements, Asa-Noir is a band you better keep an eye on. The album is released via WormHoleDeath in a standard jewel-case edition CD with 12-page booklet, including all the lyrics. The epic cover artwork is by Luciferium Wargraphics. You can visit the band’s official Facebook profile for more info and sound samples.